To upload MOBI (Amazon Kindle) versions of my eBooks to my WordPress website, I needed to install the free plugin “WP Add Mime Types.” By default, WordPress does not recognize or permit “.mobi” file uploads. By installing and configuring this plugin, however, that limitation was removed. 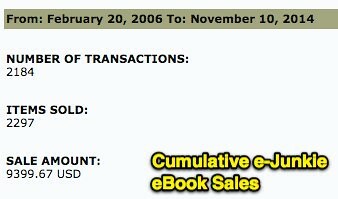 I still have an account on e-Junkie.com active for eBook purchases, but sales there have been relatively slow and that site is costing me $18 per month for the features I use. (That includes offering customer downloads of larger eBook files from Amazon S3.) In upcoming weeks, once I finish changing the links on all my websites referencing my eBooks, I’m planning to deactivate / cancel that e-Junkie account. e-Junkie does allow authors to collect contact information from customers, and I also need to migrate those emails over to my MailChimp mailing list. The e-Junkie transaction log shows that since 2011, when I first published “Playing with Media: simple ideas for powerful sharing” on the site, I’ve had almost 2200 different transactions. It’s fantastic to have the email addresses of those people who purchased one of my eBooks in the past. Hopefully by staying in contact, I’ll be able to make them (and you!) aware of new eBooks I write, videos I publish, and other opportunities to learn about effective multimedia communication.